Intelligent patchpanels, or also known as active patchpanels, actively monitor and troubleshoot the most sensitive portion of your cabling infrastructure in copper & fibre optic connections. One bad patchlead could disable an entire department access to a critical network, such as EPOS services. 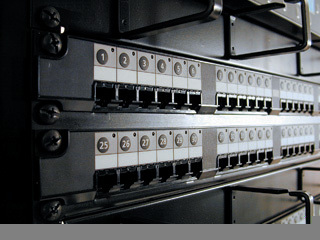 Intelligent Patchpanels iPatch System Manager Version 3.0 adds links to Network Management Systems (NMS), such as HP OpenView. This will allow users of network management tools to receive alarms from the intelligent patchpanel system to query I.T Managers. View CAD floor plans showing the location of network equipment, and to obtain physical-layer circuit traces helping you to find that fault. Active patchpanels Manager uses the industry standard SNMP (Simple Network Management Protocol) to report alarms to the customer's NMS, ensuring that these alarms will appear in the NMS standard alarm browser window. Active patchpanels Manager allows customers to specify on a per circuit basis whether or not SNMP alarms will be generated when a cabling change occurs, thus ensuring that IT Managers receive alarms only for those circuits that they have deemed critically important. Also, active patchpanels Manager Version 3.0 supports improved cable management features, such as the ability to document consolidation points, panel-to-panel cabling, fibre panels and cables, and network switching equipment.